Frenchy’s Oasis Motel is just 3 blocks away from Clearwater Beach’s pristine white sand and clear gulf waters. 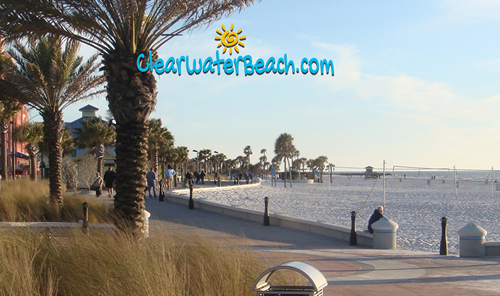 Warm sunshine and plenty of hospitality abound on Clearwater Beach. 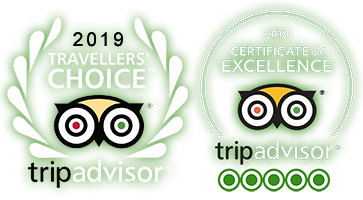 There is always something special going on and clearwaterbeach.com has a wealth of information for all your entertainment, dining, shopping and transportation needs. For 30 years, Frenchy’s restaurants have been a staple for fresh-from-the-Gulf seafood (namely the grouper caught from Frenchy’s own boats). Visit all 4 Frenchy’s on Clearwater Beach – each has its own ambiance and slightly different menus. Frenchy’s Original Cafe is a quaint cafe featuring many of Frenchy’s “original” menu items, like the Smoked Fish Spread, Greek Salad and the Super Grouper Sandwich. 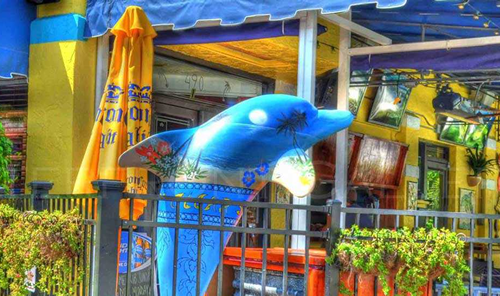 Frenchy’s Saltwater Cafe offers open-air dining inside and outside on the patio in a laid-back environment. It’s also the originator of the Grouper Rueben Sandwich. 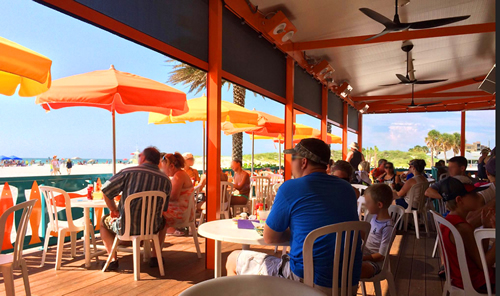 Frenchy’s Rockaway Grill has open-air beachfront dining overlooking the Gulf of Mexico. Rockaway serves up a variety of fresh seafood and other Floribbean dishes, along with the best Rum Runners on the beach! Frenchy’s South Beach Cafe boasts a Key West bistro atmosphere, open air dining (our new patio extends right up to Beach Walk!) and an unbeatable view of the ocean. This is not your classic beach souvenir shop. A favorite spot for locals and visitors alike, Frenchy’s Off the Hook gift shop boasts an eclectic variety of unique keepsakes and collectibles from jewelry to wine racks to our signature Frenchy’s hot sauce. Stock up on cool beach gear too, from hats, flip flops and sunglasses to beach towels, totes, caddies and water bottles. Frenchy’s Off The Hook is located at 49 Baymont Street, right next to Frenchy’s Original Café. You can also shop online. A dining reciept from any Frenchy’s restaurant gets you a 10% discount too! The best breakfast on the beach – only three blocks away. Venture onto the mainland for a short drive to Bright House Field during baseball season. There’s always great specials going on while you catch a Clearwater Threshers game or a Phillies Spring Training game! We’re proud to support our local sporting teams through in-stadium sponsorship. Frenchy’s is a proud partner of Pier 60′s Sunset Cinema. Every Friday and Saturday night you can bring a blanket, beach towel or low chair over to the lawn at Pier 60 to watch a FREE family-friendly movie on the jumbo, inflatable 50 ft. screen. All movies start at dusk; popcorn and drinks are available for purchase. You can view the monthly movie schedule here.